This article is about melodic modes in Indian and Pakistani music. For subgenre of reggae music, see Ragga. For similar terms, see Raga (disambiguation) and Ragam (disambiguation). A raga or raag (IAST: rāga; also raaga or ragam ; literally "coloring, tingeing, dyeing") is a melodic framework for improvisation akin to a melodic mode in Indian classical music. While the rāga is a remarkable and central feature of the classical music tradition, it has no direct translation to concepts in the classical European music tradition. Each rāga is an array of melodic structures with musical motifs, considered in the Indian tradition to have the ability to "colour the mind" and affect the emotions of the audience. A rāga consists of at least five notes, and each rāga provides the musician with a musical framework within which to improvise. The specific notes within a rāga can be reordered and improvised by the musician. Rāgas range from small rāgas like Bahar and Shahana that are not much more than songs to big rāgas like Malkauns, Darbari and Yaman, which have great scope for improvisation and for which performances can last over an hour. Rāgas may change over time, with an example being Marwa, the primary development of which has gone down to the lower octave compared to the traditionally middle octave. Each rāga traditionally has an emotional significance and symbolic associations such as with season, time and mood. The rāga is considered a means in Indian musical tradition to evoke certain feelings in an audience. Hundreds of rāga are recognized in the classical tradition, of which about 30 are common. Each rāga, state Dorothea E. Hast and others,[clarification needed] has its "own unique melodic personality". There are two main classical music traditions, Hindustani (North Indian) and Carnatic (South Indian), and the concept of rāga is shared by both. Rāga are also found in Sikh traditions such as in Guru Granth Sahib, the primary scripture of Sikhism. Similarly it is a part of the qawwali tradition found in Sufi Islamic communities of South Asia. Some popular Indian film songs and ghazals use rāgas in their compositions. Rāga (Sanskrit: राग), states Monier Monier-Williams, comes from a Sanskrit word for "the act of colouring or dyeing", or simply a "colour, hue, tint, dye". The term also connotes an emotional state referring to a "feeling, affection, desire, interest, joy or delight", particularly related to passion, love, or sympathy for a subject or something. In the context of ancient Indian music, the term refers to a harmonious note, melody, formula, building block of music available to a musician to construct a state of experience in the audience. The word appears in the ancient Principal Upanishads of Hinduism, as well as the Bhagavad Gita. For example, verse 3.5 of the Maitri Upanishad and verse 2.2.9 of the Mundaka Upanishad contain the word rāga. The Mundaka Upanishad uses it in its discussion of soul (Atman-Brahman) and matter (Prakriti), with the sense that the soul does not "color, dye, stain, tint" the matter. The Maitri Upanishad uses the term in the sense of "passion, inner quality, psychological state". The term rāga is also found in ancient texts of Buddhism where it connotes "passion, sensuality, lust, desire" for pleasurable experiences as one of three impurities of a character. Alternatively, rāga is used in Buddhist texts in the sense of "color, dye, hue". According to Emmie Te Nijenhuis, a professor in Indian musicology, the Dattilam section of Brihaddeshi has survived into the modern times, but the details of ancient music scholars mentioned in the extant text suggest a more established tradition by the time this text was composed. The same essential idea and prototypical framework is found in ancient Hindu texts, such as the Naradiyasiksa and the classic Sanskrit work Natya Shastra by Bharata Muni, whose chronology has been estimated to sometime between 500 BCE and 500 CE, probably between 200 BCE and 200 CE. In the ancient texts of Hinduism, the term for the technical mode part of rāga was Jati. Later, Jati evolved to mean quantitative class of scales, while rāga evolved to become a more sophisticated concept that included the experience of the audience. A figurative sense of the word as 'passion, love, desire, delight' is also found in the Mahabharata. The specialized sense of 'loveliness, beauty,' especially of voice or song, emerges in classical Sanskrit, used by Kalidasa and in the Panchatantra. Rāga, along with performance arts such as dance and music, has been historically integral to Hinduism, with some Hindus believing that music is itself a spiritual pursuit and a means to moksha (liberation). Rāgas, in the Hindu tradition, are believed to have a natural existence. Artists don't invent them, they only discover them. Music appeals to human beings, according to Hinduism, because they are hidden harmonies of the ultimate creation. Some of its ancient texts such as the Sama Veda (~1000 BCE) are structured entirely to melodic themes, it is sections of Rigveda set to music. The rāgas were envisioned by the Hindus as manifestation of the divine, a musical note treated as god or goddess with complex personality. During the Bhakti movement of Hinduism, dated to about the middle of 1st millennium CE, rāga became an integral part of a musical pursuit of spirituality. Bhajan and Kirtan were composed and performed by the early South India pioneers. A Bhajan has a free form devotional composition based on melodic rāgas. A Kirtan is a more structured team performance, typically with a call and response musical structure, similar to an intimate conversation. It includes two or more musical instruments, and incorporates various rāgas such as those associated with Hindu gods Shiva (Bhairava) or Krishna (Hindola). The tradition of incorporating rāga into spiritual music is also found in Jainism, and in Sikhism, an Indian religion founded by Guru Nanak in the northwest of the Indian subcontinent. In the Sikh scripture, the texts are attached to a rāga and are sung according to the rules of that rāga. According to Pashaura Singh – a professor of Sikh and Punjabi studies, the rāga and tala of ancient Indian traditions were carefully selected and integrated by the Sikh Gurus into their hymns. They also picked from the "standard instruments used in Hindu musical traditions" for singing kirtans in Sikhism. A rāga is sometimes explained as a melodic rule set that a musician works with, but according to Dorottya Fabian and others, this is now generally accepted among music scholars to be an explanation that is too simplistic. According to them, a rāga of the ancient Indian tradition is best described as "a non-constructible set in music", just like non-constructible set in language for human communication, in a manner described by Frederik Kortlandt and George van Driem. A rāga has a given set of notes, on a scale, ordered in melodies with musical motifs. A musician playing a rāga, states Bruno Nettl, may traditionally use just these notes, but is free to emphasize or improvise certain degrees of the scale. The Indian tradition suggests a certain sequencing of how the musician moves from note to note for each rāga, in order for the performance to create a rasa (mood, atmosphere, essence, inner feeling) that is unique to each rāga. A rāga can be written on a scale. Theoretically, thousands of rāga are possible given 5 or more notes, but in practical use, the classical tradition has refined and typically relies on several hundred. For most artists, their basic perfected repertoire has some forty to fifty rāgas. Rāga in Indian classic music is intimately related to tala or guidance about "division of time", with each unit called a matra (beat, and duration between beats). A rāga is not a tune, because the same rāga can yield an infinite number of tunes. A rāga is not a scale, because many rāgas can be based on the same scale. A rāga, according to Bruno Nettl and other music scholars, is a concept similar to a mode, something between the domains of tune and scale, and it is best conceptualized as a "unique array of melodic features, mapped to and organized for a unique aesthetic sentiment in the listener". The goal of a rāga and its artist is to create rasa (essence, feeling, atmosphere) with music, as classical Indian dance does with performance arts. In the Indian tradition, classical dances are performed with music set to various rāgas. Joep Bor of the Rotterdam Conservatory of Music defined rāga as a "tonal framework for composition and improvisation." Nazir Jairazbhoy, chairman of UCLA's department of ethnomusicology, characterized rāgas as separated by scale, line of ascent and descent, transilience, emphasized notes and register, and intonation and ornaments. For illustrations of ragas and raginis, see Ragamala paintings. Rāginī (Devanagari: रागिनी) is a term for the "feminine" counterpart of a "masculine" rāga. These are envisioned to parallel the god-goddess themes in Hinduism, and described variously by different medieval Indian music scholars. For example, the Sangita-darpana text of 15th-century Damodara Misra proposes six rāgas with thirty ragini, creating a system of thirty six, a system that became popular in Rajasthan. In the north Himalayan regions such as Himachal Pradesh, the music scholars such as 16th century Mesakarna expanded this system to include eight descendants to each rāga, thereby creating a system of eighty four. After the 16th-century, the system expanded still further. The symbolic role of classical music through rāga has been both aesthetic indulgence and the spiritual purifying of one's mind (yoga). The former is encouraged in Kama literature (such as Kamasutra), while the latter appears in Yoga literature with concepts such as "Nada-Brahman" (metaphysical Brahman of sound). Hindola rāga, for example, is considered a manifestation of Kama (god of love), typically through Krishna. Hindola is also linked to the festival of dola, which is more commonly known as "spring festival of colors" or Holi. This idea of aesthetic symbolism has also been expressed in Hindu temple reliefs and carvings, as well as painting collections such as the ragamala. Rāgas that have four swaras are called surtara (सुरतर) rāgas; those with five swaras are called audava (औडव) rāgas; those with six, shaadava (षाडव); and with seven, sampurna (संपूर्ण, Sanskrit for 'complete'). The number of swaras may differ in the ascending and descending like rāga Bhimpalasi which has five notes in the ascending and seven notes in descending or Khamaj with six notes in the ascending and seven in the descending. Rāgas differ in their ascending or descending movements. Those that do not follow the strict ascending or descending order of swaras are called vakra (वक्र) ('crooked') rāgas. In Carnatic music, the principal rāgas are called Melakarthas, which literally means "lord of the scale". It is also called Asraya rāga meaning "shelter giving rāga", or Janaka rāga meaning "father rāga". Classical music has been transmitted through music schools or through Guru-Shishya parampara (teacher-student tradition) through an oral tradition and practice. Some are known as gharana (houses), and their performances are staged through sabhas (music organizations). Each gharana has freely improvised over time, and differences in the rendering of each rāga is discernible. In the Indian musical schooling tradition, the small group of students lived near or with the teacher, the teacher treated them as family members providing food and boarding, and a student learnt various aspects of music thereby continuing the musical knowledge of his guru. The tradition survives in parts of India, and many musicians can trace their guru lineage. ^ a b Titon et al. 2008, p. 284. ^ a b Wilke & Moebus 2011, pp. 222 with footnote 463. ^ a b c d Lochtefeld 2002, p. 545. ^ a b Kaufmann 1968, p. v.
^ a b Nettl et al. 1998, pp. 65–67. ^ a b Fabian, Renee Timmers & Emery Schubert 2014, pp. 173–174. ^ a b c d e Nettl 2010. ^ Raja & unknown, p. unknown, Quote: "Due to the influence of Amir Khan". ^ Hast, James R. Cowdery & Stanley Arnold Scott 1999, p. 137. ^ Kapoor 2005, pp. 46–52. ^ Salhi 2013, pp. 183–84. ^ Nettl et al. 1998, pp. 107–108. ^ Douglas Q. Adams (1997). Encyclopedia of Indo-European Culture. Routledge. pp. 572–573. ISBN 978-1-884964-98-5. ^ a b c Monier-Williams 1899, p. 872. ^ Mathur, Avantika; Vijayakumar, Suhas; Chakravarti, Bhismadev; Singh, Nandini (2015). "Emotional responses to Hindustani raga music: the role of musical structure". Frontiers in Psychology. 6. doi:10.3389/fpsyg.2015.00513. PMC 4415143. PMID 25983702. ^ a b Robert E. Buswell Jr.; Donald S. Lopez Jr. (2013). The Princeton Dictionary of Buddhism. Princeton University Press. pp. 59, 68, 589. ISBN 978-1-4008-4805-8. ^ a b Thomas William Rhys Davids; William Stede (1921). Pali-English Dictionary. Motilal Banarsidass. pp. 203, 214, 567–568, 634. ISBN 978-81-208-1144-7. ^ Damien Keown (2004). A Dictionary of Buddhism. Oxford University Press. pp. 8, 47, 143. ISBN 978-0-19-157917-2. ^ Soubhik Chakraborty; Guerino Mazzola; Swarima Tewari; et al. (2014). Computational Musicology in Hindustani Music. Springer. pp. 6, 3–10. ISBN 978-3-319-11472-9. ^ a b Te Nijenhuis 1974, p. 3. ^ a b c Nettl et al. 1998, pp. 73–74. ^ Kaufmann 1968, p. 41. ^ Dace 1963, p. 249. ^ Lal 2004, pp. 311–312. ^ Kane 1971, pp. 30–39. ^ a b c Te Nijenhuis 1974, p. 2. Amiya Nath Sanyal (1959). Ragas and Raginis. Orient Longmans. pp. 18–20. ^ Caudhurī 2000, pp. 48–50, 81. ^ a b Alison Tokita; Dr. David W. Hughes (2008). The Ashgate Research Companion to Japanese Music. Ashgate Publishing. pp. 38–39. ISBN 978-0-7546-5699-9. ^ W. Y. Evans-Wentz (2000). The Tibetan Book of the Great Liberation: Or the Method of Realizing Nirvana through Knowing the Mind. Oxford University Press. pp. 111 with footnote 3. ISBN 978-0-19-972723-0. ^ Frank Reynolds; Jason A. Carbine (2000). The Life of Buddhism. University of California Press. p. 184. ISBN 978-0-520-21105-6. ^ a b William Forde Thompson (2014). Music in the Social and Behavioral Sciences: An Encyclopedia. SAGE Publications. pp. 1693–1694. ISBN 978-1-4833-6558-9. ; Quote: "Some Hindus believe that music is one path to achieving moksha, or liberation from the cycle of rebirth", (...) "The principles underlying this music are found in the Samaveda, (...)". ^ Beck 2012, pp. 138–139. Quote: "A summation of the signal importance of the Natyasastra for Hindu religion and culture has been provided by Susan Schwartz (2004, p. 13), 'In short, the Natyasastra is an exhaustive encyclopedic dissertation of the arts, with an emphasis on performing arts as its central feature. It is also full of invocations to deities, acknowledging the divine origins of the arts and the central role of performance arts in achieving divine goals (...)'"..
^ a b Dalal 2014, p. 323. ^ Staal 2009, pp. 4–5. ^ Denise Cush; Catherine Robinson; Michael York (2012). Encyclopedia of Hinduism. Routledge. pp. 87–88. ISBN 978-1-135-18979-2. ^ Nettl et al. 1998, pp. 247–253. ^ Lavezzoli 2006, pp. 371–72. 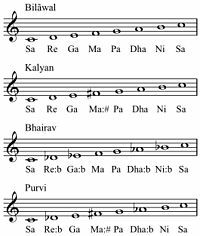 ^ Brown 2014, p. 455, Quote:"Kirtan, (...), is the congregational singing of sacred chants and mantras in call-and-response format. "; Also see, pp. 457, 474–475. ^ Gregory D. Booth; Bradley Shope (2014). More Than Bollywood: Studies in Indian Popular Music. Oxford University Press. pp. 65, 295–298. ISBN 978-0-19-992883-5. ^ Sastri 1943, pp. v–vi, ix–x (English), for raga discussion see pp. 169–274 (Sanskrit). ^ Powers 1984, pp. 352–353. ^ Kelting 2001, pp. 28–29, 84. ^ Stephen Breck Reid (2001). Psalms and Practice: Worship, Virtue, and Authority. Liturgical Press. pp. 13–14. ISBN 978-0-8146-5080-6. ^ a b Pashaura Singh (2006). Guy L. Beck, ed. Sacred Sound: Experiencing Music in World Religions. Wilfrid Laurier University Press. pp. 156–60. ISBN 978-0-88920-421-8. ^ Paul Vernon (1995). Ethnic and Vernacular Music, 1898–1960: A Resource and Guide to Recordings. Greenwood Publishing. p. 256. ISBN 978-0-313-29553-9. ^ Regula Qureshi (1986). Sufi Music of India and Pakistan: Sound, Context and Meaning in Qawwali. Cambridge University Press. pp. xiii, 22–24, 32, 47–53, 79–85. ISBN 978-0-521-26767-0. ^ Fabian, Renee Timmers & Emery Schubert 2014, pp. 173–74. ^ a b c Martinez 2001, pp. 95–96. ^ van der Meer 2012, pp. 6–8. ^ Bor, Joep; Rao, Suvarnalata; Van der Meer, Wim; Harvey, Jane (1999). The Raga Guide. Nimbus Records. p. 181. ISBN 978-0-9543976-0-9. ^ Jairazbhoy 1995, p. 45. ^ a b Dehejia 2013, pp. 191–97. ^ a b Dehejia 2013, pp. 168–69. ^ Jairazbhoy 1995, p. [page needed]. ^ Lavezzoli 2006, pp. 17–23. ^ Randel 2003, pp. 813–21. ^ a b c Te Nijenhuis 1974, pp. 35–36. ^ a b Paul Kocot Nietupski; Joan O'Mara (2011). Reading Asian Art and Artifacts: Windows to Asia on American College Campuses. Rowman & Littlefield. p. 59. ISBN 978-1-61146-070-4. ^ Sastri 1943, p. xxii, Quote: "[In ancient Indian culture], the musical notes are the physical manifestations of the Highest Reality termed Nada-Brahman. Music is not a mere accompaniment in religious worship, it is religious worship itself"..
^ Te Nijenhuis 1974, p. 36. ^ Te Nijenhuis 1974, pp. 36–38. ^ Forster 2010, pp. 564–565; Quote: "In the next five sections, we will examine the evolution of South Indian ragas in the writings of Ramamatya (fl. c. 1550), Venkatamakhi (fl. c. 1620), and Govinda (c. 1800). These three writers focused on a theme common to all organizational systems, namely, the principle of abstraction. Ramamatya was the first Indian theorist to formulate a system based on a mathematically determined tuning. He defined (1) a theoretical 14-tone scale, (2) a practical 12-tone tuning, and (3) a distinction between abstract mela ragas and musical janya ragas. He then combined these three concepts to identify 20 mela ragas, under which he classified more than 60 janya ragas. Venkatamakhi extended (...).". ^ Soubhik Chakraborty; Guerino Mazzola; Swarima Tewari; et al. (2014). Computational Musicology in Hindustani Music. Springer. pp. 15–16, 20, 53–54, 65–66, 81–82. ISBN 978-3-319-11472-9. ^ a b c Te Nijenhuis 1974, p. 14. ^ Te Nijenhuis 1974, pp. 13–14, 21–25. ^ a b c d Randel 2003, p. 815. ^ Winternitz 2008, p. 654. ^ a b Te Nijenhuis 1974, p. 32-34. ^ Te Nijenhuis 1974, pp. 14–25. ^ Reginald Massey; Jamila Massey (1996). The Music of India. Abhinav Publications. pp. 22–25. ISBN 978-81-7017-332-8. ^ Richa Jain (2002). Song of the Rainbow: A Work on Depiction of Music Through the Medium of Paintings in the Indian Tradition. Kanishka. pp. 26, 39–44. ISBN 978-81-7391-496-6. ^ Randel 2003, pp. 815–816. ^ a b Randel 2003, p. 816. ^ a b c Caudhurī 2000, pp. 150–151. ^ Tenzer 2006, pp. 303–309. ^ Nettl et al. 1998, pp. 457–467. ^ Ries 1969, p. 22. Dehejia, Vidya (2013). The Body Adorned: Sacred and Profane in Indian Art. New York: Columbia University Press. ISBN 978-0-231-51266-4. Fabian, Dorottya; Renee Timmers; Emery Schubert (2014). Expressiveness in music performance: Empirical approaches across styles and cultures. Oxford University Press. ISBN 978-0-19-163456-7. Hast, Dorothea E.; James R. Cowdery; Stanley Arnold Scott (1999). Exploring the World of Music: An Introduction to Music from a World Music Perspective. Kendall Hunt. ISBN 978-0-7872-7154-1. Kane, Pandurang Vaman (1971). History of Sanskrit Poetics. Motilal Banarsidass. ISBN 978-81-208-0274-2. Khan, Hazrat Inayat (1996). The Mysticism of Sound and Music. Shambhala Publications. ISBN 978-0-8348-2492-8. Kapoor, Sukhbir S. (2005). Guru Granth Sahib – An Advance Study. Hemkunt Press. ISBN 978-81-7010-317-2. Kelting, M. Whitney (2001). Singing to the Jinas: Jain Laywomen, Mandal Singing, and the Negotiations of Jain Devotion. Oxford University Press. ISBN 978-0-19-803211-3. Lochtefeld, James G. (2002). The Illustrated Encyclopedia of Hinduism, 2 Volume Set. The Rosen Publishing Group. ISBN 978-0823922871. Nettl, Bruno (2010). "Raga, Indian Musical Genre". Encyclopædia Britannica. Nettl, Bruno; Ruth M. Stone; James Porter; Timothy Rice (1998). The Garland Encyclopedia of World Music: South Asia: The Indian Subcontinent. New York and London: Routledge. ISBN 978-0-8240-4946-1. Salhi, Kamal (2013). Music, Culture and Identity in the Muslim World: Performance, Politics and Piety. Routledge. ISBN 978-1-317-96310-3. Winternitz, Maurice (2008). History of Indian Literature Vol 3 (Original in German published in 1922, translated into English by VS Sarma, 1981). New Delhi: Motilal Banarsidass. ISBN 978-8120800564. Hindustani raag Sangeet Online A rare collection of more than 800 audio & video archives from 1902. Radio programs dedicated to famous raags. This page was last edited on 6 April 2019, at 20:34 (UTC).